Finally, a real chase. SDS had been setting in bigtime, since it had been a quiet spring and I had been out of town on the only really good chase day. So it was very good to get out and pursue some supercells! The setup: The storm system that triggered the deadly May 3 tornadoes in Oklahoma and Kansas promised to kick up some severe weather for yet a third day. The 15Z RUC showed both CAPE and helicity increasing as one moved south roughly along the Mississippi River from St. Louis, reaching maxima around and just south of the Memphis area, where afternoon/evening CAPEs were progged in the 3000-4000 range with SRH 300-500. The morning ETA run was in general agreement, but put the peak dynamics a little farther south in northern Mississippi, where EHI was progged to exceed 9 by 0Z. The center of strong low pressure was over Nebraska and the system was negatively tilted. My analysis of the 15Z surface data showed the dryline had nosed almost into the St. Louis area, extending from NE MO to just west of St. Louis then southwestward through AR. It's not often we get to play the dryline in IL, but today might be the day! Farther west, a cold front extended from the low to the MO/KS border then back to the SW. Even this far from the low the pressure was quite low, around 29.55 inches in the STL area. SPC issued the third high risk in as many days, focusing on the area just south of Memphis, TN. A moderate risk extended north into far southern IL. The temperature had risen to 79 in bright if hazy sunshine in Edwardsville, so I figured the instability in southern IL would be at least as good as progged. When I checked the 16:30Z outlook just before heading out, there was no change in the risk areas. A last-minute check of the radar showed a line of storms starting to form southeast of St. Louis ahead of the dryline. The latter confirmed my basic chase strategy. I would head southeast from St. Louis on I-64, then south on I-57. If good storms went up in IL, I would observe them for a while then decide what to do next. If not, I would continue south on I-57 into the better dynamics. If need be, I could get to the northern fringe of the Memphis area well before dark, though urban traffic and eastward movement of storms would likely make this as far south as I might get. Figuring I had a lot of choices with this strategy, I headed out. 12:00 - Out the door. I head down I-255 to I-64, then SE on I-64 to get ahead of the advancing dryline. At the intersection with I-64, I noticed the sky was a clearer blue to the west, still hazy and murky (though mostly cloud-free) to the east. This led me to surmise that the dryline had surged on into the St. Louis area and was now entering IL. This was confirmed around 12:30, when I stopped at the rest area near Mile Marker 25 and checked the DTN weather center (they have them at all IL rest areas now). It showed that the relative humidity had fallen to 48 in STL, while with similar temperatures it was as high as 82 to the east along I-57. Later, I also heard a discussion on NWR from Paducah indicating that the dryline had surged into SW IL and had about a 20-degree dewpoint gradient though little difference in temperature. The radar at the rest area also showed that a line of storms was ahead of me just SW of I-64 and about 10 mi. west of I-57. I decided to catch up with these and see if anything looked interesting, though the storms did not yet look strong on the radar. About 5 minutes after I left the rest area I could see the first towers to the SE, and they looked quite hard if not overly high. I put the car radio on AM to see if there was any storm static. There wasn't. Gradually I catch up with the storms, and pass through light rain between two weak cells; the one to the south appeared slightly heavier. I exited the freeway and headed south through the town of Woodlawn to work my way down the line, hoping the tail-end storm might strengthen. An occasional burst of static could now be heard on the radio. 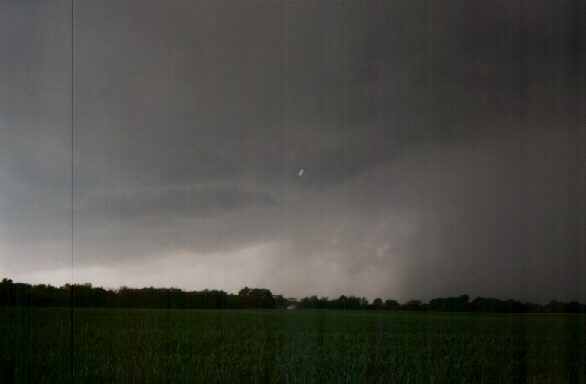 By 1:20 I was in the town of Woodlawn looking west toward a break in the line - scuddy updraft base. I was now starting to notice a considerable increase in the amount of static on the radio, and the sky to the southwest was darkening. I proceeded farther south on the same road for a better look. 1:40 - After skirting the eastern edge of an obviously-stronger storm, I clear the precipitation to see a nice updraft base just SW of a very heavy precipitation core. I stopped to watch, photograph, and videotape what now appeared to be a severe storm from about 5 or 6 miles south of Woodlawn, IL (just west of Mt. Vernon). The storm now was producing almost continuous lightning, close enough that I got out of the car only long enough for quick snapshots and videotaped mostly through an open window from inside the car. (This thing went from no static on AM radio to nearly continuous in less than half an hour.) Very soon after I stopped, I heard a severe thunderstorm warning on this storm, with Paducah Doppler indicating a severe storm near Woodlawn. There were a few small lowerings, including this one, which I thought at first might be a developing funnel cloud. It had a nice clear slot in front of it, which added to my thinking of what might develop. However, it dissipated very quickly - never really got its act together. After a while, the storm was getting away from me and it was time to move. I returned a few miles north to highway 15 to head east a few miles toward Mt. Vernon. I noticed leaves stripped off trees along IL route 15, near where I turned off the north-south road. This led me to suspect there had been large hail, though none was visible on the ground. Later, when I saw the LSR on this storm, I saw that indeed there was - 3.5 inch hail had been reported in Mt. Vernon at 2:10. I paused when I got to Mt. Vernon to try to decide what to do - continue in pursuit or drop south hoping for an other storm in the better instability farther south. I decided on the latter because it was increasingly evident that catching this storm again was a lost cause - it was rapidly getting away as it moved off to the NE. The town of Mt. Vernon was in the way, and it would have been long gone by the time I drove through town. I thought about heading north on I-57 and cutting east to catch up with the storm, but there was no exit for some distance north according to the map. Time to drop farther south and hope for another storm. 2:30 - The hope wasn't long being answered. I had headed south on I-57 and now began to see a huge backsheared anvil ahead near Marion. Straight ahead was darkness in what was obviously the core of the storm. To head in to that was to risk getting pummeled by large hail. Very wisely, as it turned out, I exited toward Herrin on to avoid driving into core. As I headed toward Herrin, a SVR was issued, specifically mentioning the risk of "very large hail." As I got into Herrin, I saw increasingly impressive storm structure to the south. 2:40 - Since the storm was to the south and I was at the north edge of Herrin, I had to work my way through town. As so often happens, while in Herrin I got caught traffic, which seemed to swamp the whole town after the high school was dismissed. Sitting in traffic, I was looking at a beautiful, almost LP-ish supercell structure: beavertail, vault, and back-sheared anvil to my south. Although I didn't know it at this time, the supercell had split about the time I exited the freeway, as shown on a radar loop provided by Chris Novy. What I was looking at was the left-mover, which explains the unexpected movement I encountered a few minutes later. While I struggled in the traffic, a TOR was issued due to Doppler indication of rotation just south of Marion. By the time I reached edge of town, the storm appeared to be backbuilding rapidly to west. I turned west again, and saw a small wall cloud, but the core appeared to shear away from the backbuilding updraft and head off to the east. The more I thought about this after the chase, the more suspicious I became that there had been a split. When Chris sent me the radar loop, this was confirmed. The right mover - as usual the stronger of the two storms, passed over Marion and headed away to the ENE while I was backing away to the left to get out of the way of the left mover. The left mover headed over or just east of Herrin then appeared to weaken for a while as it moved toward the NNE. The LSRs on this supercell indicate baseball hail in Marion at 2:45, which probably came from the right-mover, perhaps in the RFD - the storm had a very pronounced hook echo south of Marion. I later found out from Chris Novy that this storm dropped at least one 5-inch hailstone, which was later videotaped by a photographer. Curiously, the sirens in Herrin began to blow a good 15 minutes after the tornado warning had been issued. Perhaps they were not sounded initially because the circulation detected by radar was south of Marion and not moving toward Herrin - then someone decided to sound them based on the appearance of the left-mover, which was for a short time quite threatening. Or maybe the system is just slow. 3:00 - A tornado watch was issued, effective from 3:00 till 9:00. This seemed to kill the convection, which now looked mushy and no longer at all backsheared. Farther off to the east, I did see some backsheared anvil that I thought was from another storm moving up out of Kentucky. But after reviewing the radar loop, I now realize this was the right-mover - I had been driven so far west by the left-mover while the right mover continued eastward that I was that far away from it. After returning east to Marion on IL route 13, I decided to head north, then east on the interstates to attempt another intercept. I made this decision to avoid losing even more time driving through Marion and dealing with the poor road network east of there. But since at the time I did not realize there had been a split, what I was planning to intercept was the left mover, not the whole storm as I thought. As I headed up I-57 then east on I-64, I made two more stops at rest areas to check radar. Both times I saw the two supercells - the first one I had been on, which was now heading into east-central IL, and the Marion right mover, which appeared to be in far SE IL. The left mover had temporarily weakened and did not show up very well on the regional radar at the rest stops. I decided to head east on I-64, thinking I could eventually catch up to the SE IL storm. I did this even though I could see a new line of convection going up to the NW - though a fairly long line of storms was developing, they looked low-topped, weak, and like they were merging into a squall line. Chasing the individual cell to the SE looked like a better idea. 4:30 - I could see the storm come back into view to my south as I headed into Wayne county. I was somewhat surprised at this, because it had looked farther away than that on the radar. Of course the reason for the surprise is that what I was passing north of was the left-mover - the right mover was still so far away I couldn't see it. But I didn't know at that time that there had been a split, and thought I was catching up to the whole storm. So, once I was ahead of it, at the intersection of IL route 242 and I-64, I stopped at about 4:40 and waited for the storm to again approach. In the next 15 minutes it passed to the north of me, and it had a supercell look to it again - round, "flying saucer" base and tower tilting slightly to NE, vault visible again. But gradually the base became elongated and cell seemed to merge with a line of storms that had developed to its north. Also, anvil from storms in SE MO had now overspread the sky, cutting down the heating that had been feeding the storm. I gave up and headed back west, but later the storm seemed to regain its supercell characteristics, and it caused wind damage near Olney, IL just after 6:00. 5:20 - At a rest area SE of Mt. Vernon, I again checked the radar. An MCS had now formed all around me. Around the time I stopped, updrafts on an outflow boundary moved over from south, and afterward, a stiff wind blasted light rain in from the south. It seemed to be coming from the anvil of storms to the south. Occasional anvil zits flashed in the southern and southwestern sky. I decided to go back west on I-64 for a new line of storms the radar showed developing between St. Louis and Mt. Vernon. These storms looked stronger, and there seemed to be generalized rain all around the immediate area where I was, nothing severe-looking on the radar. By doing this, I missed a brief tornado SE of Salem, IL a little after 6:00. (However, I'd say there's a good chance it was rain-wrapped.) I didn't hear the SVR issued on this storm at 5:30, which came from STL - I could only get the PAH weather radio in this area, and the commercial station I had on didn't broadcast the warning. I headed west from Carlyle on U.S. route 50, after detouring north as the new storms seemed to move north of I-64. I had turned west after realizing the storms to the north were weakening while better storms were off to the west. I soon realized I was heading toward a pretty strong storm. 6:45 - I watched a beautiful backlit wall cloud on a storm between Collinsville and Highland. NWS STL had issued a SVR for this storm or for another just to its NW. 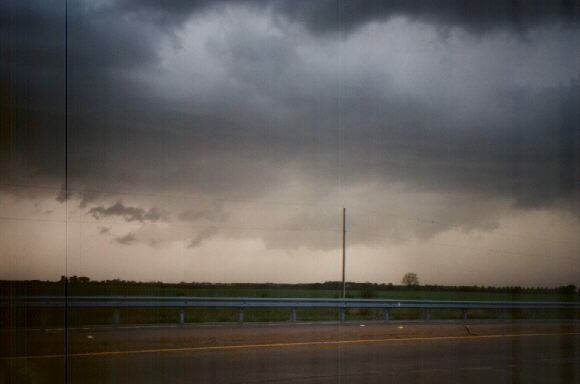 After 5-10 minutes the wall cloud occluded, and I proceeded into Lebanon and turned north on IL route 4. I followed that toward an impressive-looking storm that appeared to be somewhere near New Douglas. Both this storm and a line of elevated storms to the northwest were putting down quite a bit of CG lighting. 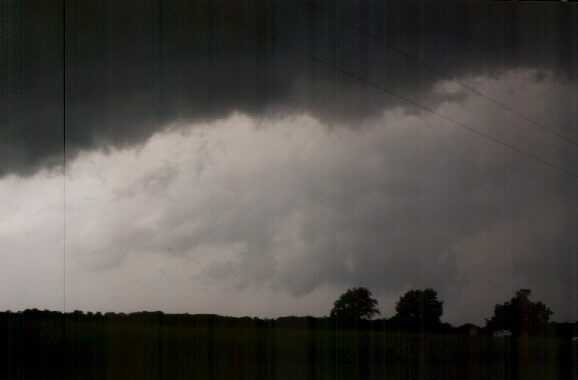 At the southern end of the line of elevated storms was a wall cloud-like structure, except that it was elevated. I was surprised to learn later that these elevated storms triggered warnings from Sangamon Co. well to the northeast, and produced some reports of large hail. But it was now getting dark, and the chase was over. I stopped and gassed up at Hamel and headed back down I-55 to Edwardsville. 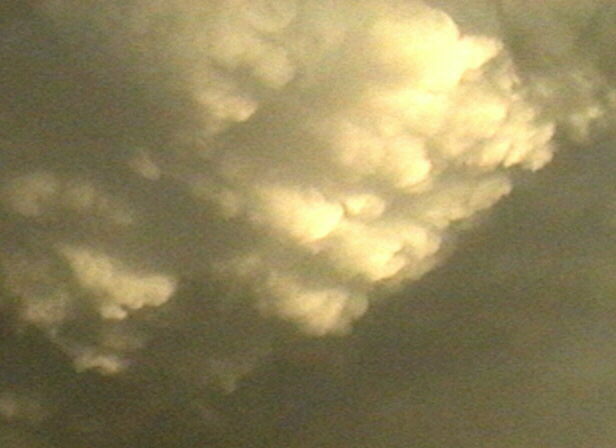 Some mammatus clouds on the back side of the storms to the east were beginning to be sunlit. 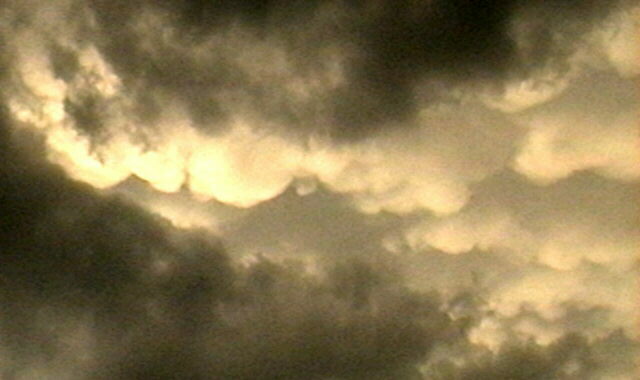 7:30 - At edge of Edwardsville, I photographed the increasingly spectacular sunlit mammatus on the back side of the storms. 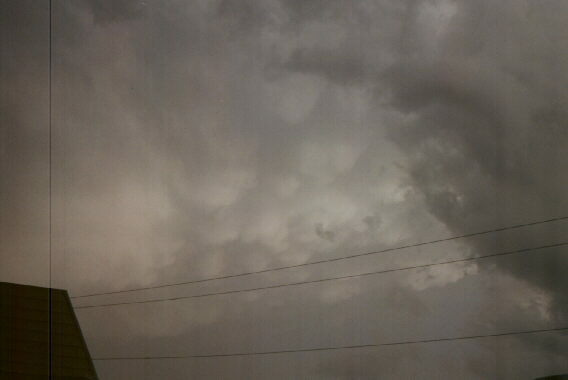 (This photo, though not bad, does not do it justice - it was very impressive, stretching a long distance through the sky from the NNW to the SSE) I also got some video and got a couple video snaps of the sunlit mammatus, which turned out somewhat better. A nice end to an interesting and enjoyable day. Final thought - it sure was nice to get out and see 3 pretty impressive storms, even if the one tornado did elude me. And it was also neat to witness a splitting supercell, even if I did not fully understand what was going on at the time. Total chase distance: 350 miles. MILES WEST OF MOUNT VERNON...MOVING NORTHEAST AT 35 MPH. SUBSTANTIAL SHELTER...AND STAY AWAY FROM WINDOWS. SALEM ILLINOIS... MOVING NORTHEAST AT 35 MPH. MILES SOUTHEAST OF SALEM...MOVING NORTHEAST AT 40 MPH. MILES SOUTH OF MARION...MOVING NORTHEAST AT 35 MPH. ROOM OR HALLWAY ON THE LOWEST FLOOR...PREFERABLY A BASEMENT. SOUTHWEST INDIANA. AND WESTERN KENTUCKY. AND SOUTHEAST MISSOURI.